As follow-up to last week’s call to action, “Tidal Turbines in Whale Epicentre? 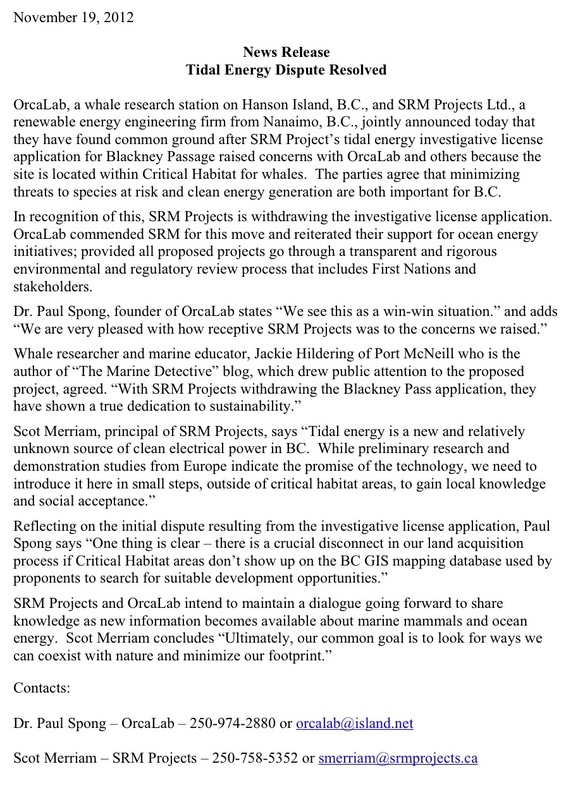 Hell No!” , I am so pleased to relay the following media release from myself, the OrcaLab and the proponent, SRM Projects Ltd. The short of it is, due to the efforts of many (including you) and the integrity and ethics of the proponent – the application for an investigative license for ocean power in whale critical habitat has been withdrawn. For details of how this resolve was achieved see this OrcaLab blog item. Humpback whale “KC” (BCY0291, born in 2002) breaching in Blackney Pass. The investigative license application for ocean power has now been withdrawn for this area. Tidal Turbines in Whale Epicentre? Hell No! Yes! Yes! Yes! Excellent work by everyone to step up and steer progress in the right direction! It’s fantastic to see people working together for good locations for ocean power generation and the conservation of marine mammals! Congratulations! It pays to educate, educate, educate, then educate some more. Fantastic news, well done to all concerned, particularly the Marine Detective not least for letting us all know so we could voice objections. FANTASTIC NEWS! Thank you Marine Detective for your hard work and dedication in bringing this situation to our attention, and to all parties for reaching an agreement so quickly! Thank you!! Leah, as a human being, life continues to amaze me as to the power of the community, the strength of those that are dedicated to a cause and the tough stands that you all endeavor for the sake of that cause. During what initially must have appeared as formidable task ahead, I, as a Mother, am so very proud of your efforts for what you believe in. I have forwarded this to Leah and “approved” the comment on the blog Leah’s Mom. It made me cry. You indeed have an astounding daughter, as beautiful on the inside as she is on the outside. Reblogged this on Radical Tides. Fantastic! This just made my day. Thanks for keeping us informed. Yeah! Thanks so for all you’ve done and do Susan. There are 5 to 6 applications in process. SRM in dropping one application out of 6, is using a technique used by all resource extraction companies. It is called hedging your bets! Just look at the last story of Fish Lake on Landwatch titled, Taseko hedges its bets on November 13th. Orcas roam the entire BC coast. 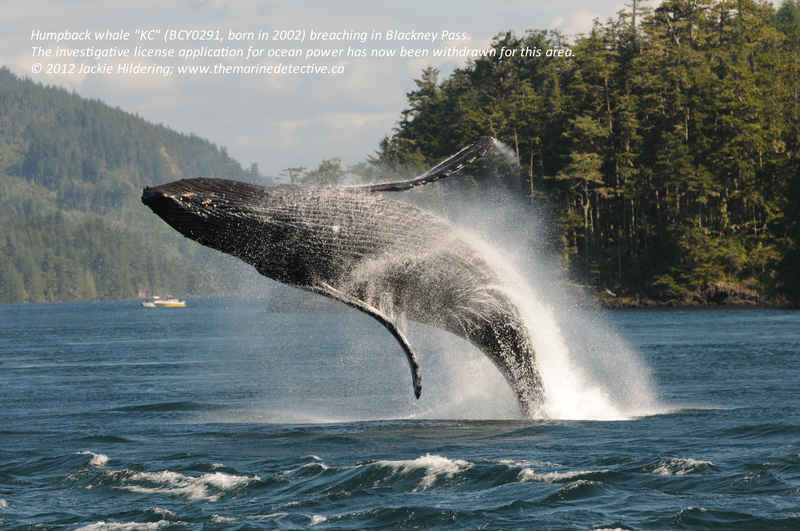 The whole BC coast is critical habitat for many species including Orcas, humpback whales. We, BC’s coast, are one of the last pools of biodiversity left on this planet. We have whales migrating here because their ocean habitats are decreasing. There is no food left for them in acid dominated seas. SRM will go to the area of least resistance. Resolving this dispute should entail dropping all tidal turbine applications by SRM in BC and banning these applications alright. The problem is really with The Ministry of Crown Lands, the BC Liberals, for giving out these investigated permits in the first place. Should we entertain any Tidal Power application at all? Should we ban all Tidal Power project in BC? These are the questions that should have been asked in a long public forum and a year long process in the first place, long before any applications were entertained in the Lands Branch. We are being sucked in! The Tidal power battle to ban all these deadly machines from our coast has just begun. Everyone wants our marine mammals and salmon to roam freely on our west coast and not be subjected to huge underwater noise and blade chopping processes. Some environmentalists are being conned by the industry. There might be a tidal power design out there that is less intrusive, but power generating economics dictate a very intrusive blade turbine and underwater type wind mill design. These are deadly to all kinds of marine life. The tidal power industry knows this. Great insight , thank you! We are becoming desperate for sustainable energy sources, and, as fossil fuels begin to fail and our environment reaches its carrying capacity for the consequences of fossil fuel use, we will become ever more desperate. The threats of “tar oil” spill on our ocean habitats are a clear and present danger, a danger created by a contest to see which nation will hold the last viable reserves of fossil fuels. Those reserves will be the essential “transition fuels” to renewable energy forms. One renewable energy supply could very well be a combination “energy farm” that optimizes tidal, wind and solar by using hydrogen as a “firming up” resource and “LNG” as a firm back-up. While it is abundantly clear that massive hydro electric development on the Columbia River System has severely diminished the salmon food resource, it is also true that much innovation has been created to mitigate the effects of “turbines” on fish. Whales represent a quantum increase in that challenge. It is a challenge that we must learn to meet. One part of that challenge is to create a viable application of “triple bottom line accountability” to help us choose the optimum energy supply technology and locations for that supply. A significant component of the question is how close to load centres are the locations, since transmission line losses cost roughly 11% of production. Locating tidal power in remote locations may prove to not be feasible for this reason alone. We need a “decision support system” that can handle the multiple objectives presented by energy development and use. Simply saying “no” will not satisfy the good of the commons or the common good.